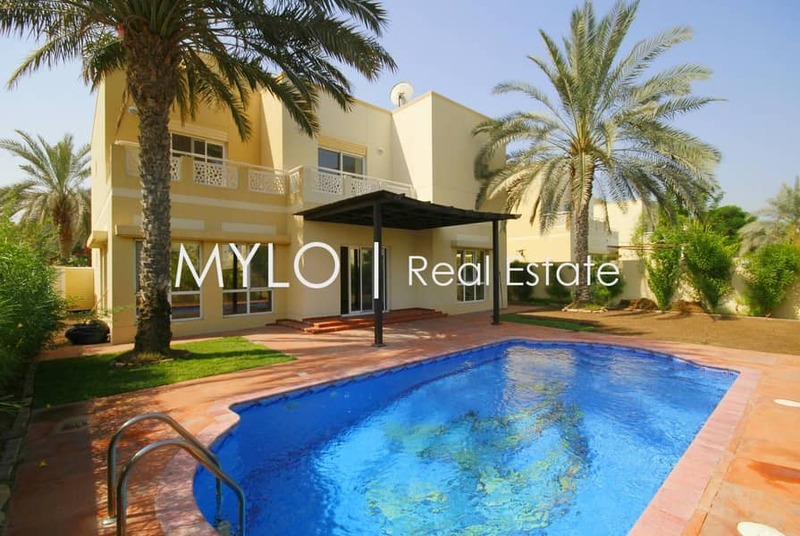 MYLO Real Estate and Laura are proud to present this beautiful and bright villa with five bedrooms, one downstairs and four on the upper floor with a spacious landing. The villa is beautifully maintained and consists of a separate living and dining room, a family room, guest room with ensuite, storage, kitchen, powder room, laundry room, maids room and double enclosed automatic car port. The second floor offers a master bedroom with ensuite bathroom, terrace and built in storage Two spacious bedrooms share a bathroom and the 4th bedroom has ensuite. It also has a huge landing that could be used as an additional family room. It's situated in prime location and the private pool and landscaped garden are in excellent condition. This villa is across from the park of Meadows 4. Upgraded wooden floors on the ground floor. Villa is vacant, ready to move in.